This week begins a new series on Life On This Planet - Concert Film Of The Day. I will be watching 5 live concert videos and then featuring one every day this week. Keep up on my daily postings by clicking LIKE over at the Life On This Planet Blog Page on Facebook. 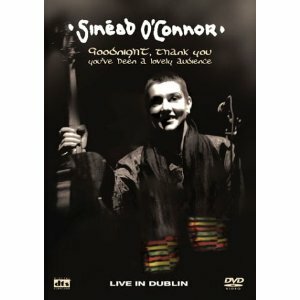 In 2002, Sinead O'Connor announced her retirement from music - today's Concert Film Of The Day was to be her farewell. Filmed live in Dublin, in front of her hometown audience, it's an intimate show and begins as such, with a dedication of the Irish song, Molly Malone, to her 'daddy' who is in the audience. Most of the tracks performed at this show are taken from her most recent effort at the time, Sean-Nos Nua, which exclusively featured reworkings of traditional Irish songs. O'Connor's vocals are amazing, and it shows on 'My Lagan Love,' and a spectacular version of the song that put her on the international map - Prince's 'Nothing Compares 2 U.' The band is amazing, with a wide range of instrumentation, including concertina, violins and cello. 'John, I Love You,' taken from her fourth album, 1994's Universal Mother, shines even brighter with this band. The show ends with a dynamic version of 'The Last Day Of Our Acquaintance.' Thankfully, retirement didn't last long for O'Connor - she released a new album just a few years later. The DVD has a documentary and six music videos as bonus content.